Picture Books: Guess What? There's a Hippopotamus on the Hospital Roof Eating Cake! TITLE:"Guess What? 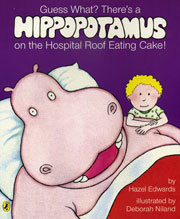 There's a Hippopotamus on the Hospital Roof Eating Cake!" Film Adaptation: Pocket Bonfire: World Premiere: 2011 Edinburgh Film Festival international screening. The hippopotamus helps and reassures during hospital visits, demystifying procedures and comforting overnight. Hazel reading to patients at Ronald McDonald House, Parkville. Cake Angels donated the hippo cake. Buy your own copy of Guess What? There's a Hippopotamus on the Hospital Roof Eating Cake! To celebrate the 30th anniversary of the original Hippopotamus book, Puffin created some fun Hippo Party materials. You can visit the Puffin website or download the items here. 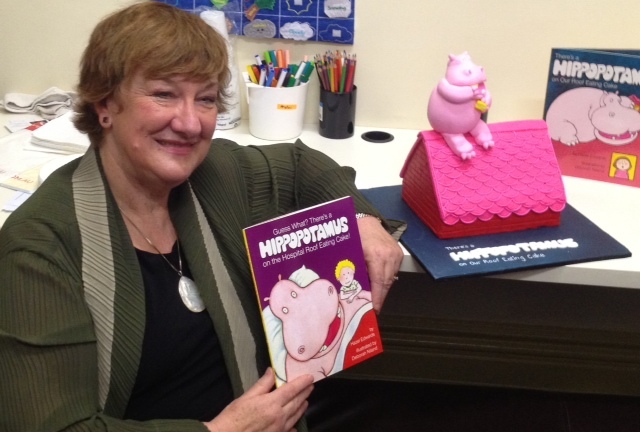 The Hippopotamus series can provide an imaginative and fun theme for the kindergarten, classroom and the school community as a whole. (Click here to look at Our Hippo Classroom Plays). A range of resources are available for download below. Enjoy! Have you read Guess What? There's a Hippopotamus on the Hospital Roof Eating Cake! Why not send Hazel a comment? You can email Hazel, tweet Hazel or post a message on her Facebook Page.